In order to ensure the best result, it pays to assign a trained and experienced HVAC or earth-works contractor for the installation work. The Pump Well (biolan-well-dwg) is installed in an upright position on an even and compacted bed (at least 150 mm thick) of gravel, crushed stone or sand. The installation depth is determined according to the elevation of the sewer coming from the property. While installing gravity flow drainage, a sufficient gradient (of at least 1-1,5 %) needs to be provided to allow the wastewater to flow without obstruction from the sewer outlet of the house all the way to the Pump Well.The maximum depth of the Pump Well from the inlet connector to the ground surface is about 750 mm. As necessary, the neck-part of the well can be shortened by at maximum 700 mm. The backfill soil of the excavation must be non-susceptible to frost, for example sand. The backfill must not contain large or sharp stones. The backfill shall be compacted after each layer of about 300 mm. The Pump Well must be anchored, if buoyancy may occur resulting from the presence of groundwater. The bottom of the Pump Well is fitted with brackets for anchoring. The well can be anchored, for example, using 1-m-long ribbed reinforcement bars (rebar 15 mm in diameter). If the buoyancy caused by the groundwater is strong, a concrete slab or pre-fabricated anchoring slabs (for example) should be used for anchoring. Consult your engineer if in doubt. The inlet connector is 75 mm in diameter, but it is also possible to connect a pipe 110 mm in diameter to it. Use a connecting sleeve with gasket for connection. The pressure sewer is piped through the cover of the Pump Well into the Biolan Greywater Filter. The position of the lead-through for the pipe and the electric conductor, which shall be opened by sawing, is marked in the cover on the well. A fabric-reinforced hose with smooth surface and 32 mm in diameter is used as pressure sewer pipe. Where a Pump Well is used in winter, it should be insulated using, for example, slabs of expanded polystyrene, if the covering depth of the well is less than 750 mm. It is also recommended that a slab of insulation be installed under the well cover for use in winter. Installing the pump in the well – The pump is placed at the bottom of the well. The bulge in the cover of the well shall be cut off to make an opening for the pressure pipe leaving pump and the electric cable. The pump is lowered to the bottom of the well and lifted for maintenance using the cord fixed to it. Connecting the Biolan Submersible Pump to the Filter – Connect the 32mm smooth surface fabric-reinforced hose to the Submersible Pump and tighten with a hose clamp. A reduction sleeve is needed for connecting the hose coming from the pump to the Greywater Filter. reducing 75 mm to 32 mm (HVAC-number 2480 104). 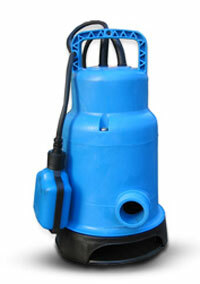 The Pump Well must be emptied and the Submersible Pump serviced at least once a year. Lift the pump up from the well. Open the suction chamber of the pump and clean out possible hair, grease or debris. Check the connection of the hose to the pump. If the greywater filter is not used in winter, lift the pump up from the Pump Well in the autumn. 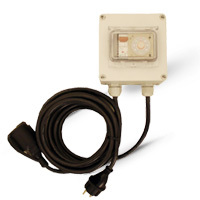 The Biolan Timer ensures that wastewater is pumped into the Greywater Filter in suitable quantities. The Timer is connected between the submersible pump and the power source. Splash-proof rating of the Timer housing is IP54, which means it is splash-proof. The flow of the pump must be measured after it’s installation, before setting the timer.The pumping time shall be set to so that each batch of water delivered to the filter is about 20 litres and the filter boxes do not run over; generally between 10-30 seconds. The pause time shall be set so that the uppermost filter boxes will be able to absorb the water from the previous operating period before the next pumping period starts. A recommendable pause time is 10-20 minutes. A break of at least 5 minutes is required. Check the operation of the Timer once a year by observing the pump on duration and the pump off duration. As necessary, adjust the pumping time as per above.